A while back I finally had the pleasure to stop at a place I’d heard a lot about over the years. It had almost become an urban legend in my mind. I was glad to see (and taste) that it actually existed, while managing to live up to the hype. 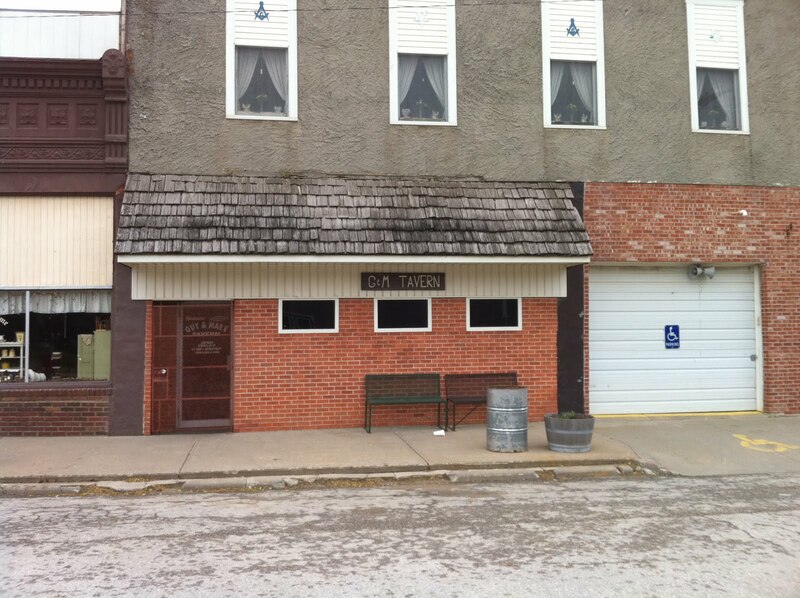 The place is none other than Guy and Mae’s Tavern in Williamsburg, KS. It’s known far and wide for serving up delicious pork ribs in a no-frills fashion, and won’t disappoint the seeker of all things BBQ! Williamsburg is located a mile or so south of I-35, out between BETO Junction and Ottawa (it’s about a 20 minute drive from either Ottawa or BETO Junction). You about have to be going there on purpose, or lost, to find the place, but it is well worth your time if you’re a rib fan! “Guy and Mae’s” is about the only thing going on in Williamsburg anymore, but it continues to pull people in from all over the region, wanting to get a taste of the famous ribs. 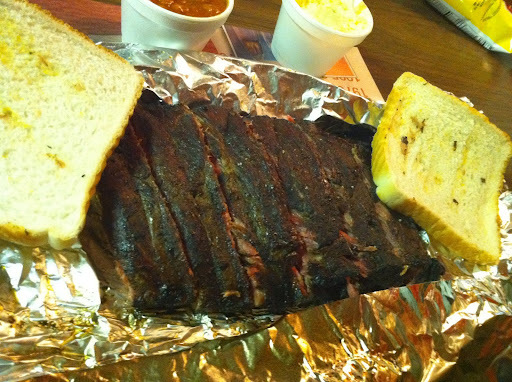 As you can see in the picture, the ribs are certainly served up in the most basic fashion. What the picture doesn’t show is how they look when they are served. It is a mess of foil that you open up, revealing 2 slices of white bread, with a beautiful slab of ribs under them, and a folded up newspaper under the ribs. It just seems like the way ribs were meant to be served! The ribs were excellent. They were very tender and were about as lean as ribs get. The meat came off the bones and pulled apart almost like you’d expect tender pot roast to do. An added bonus is that the ribs at Guy and Mae’s are trimmed to be “St. Louis Style”, meaning that the cartilage and sternum are cut off, making them fast and easy to eat. The dry rub provided all the flavor I needed, and it was a good thing. I was not fond of the house BBQ sauce; the only drawback to the entire experience. If you’re not in the mood for ribs, you have some other choices, but not many! The menu is basic to say the least. 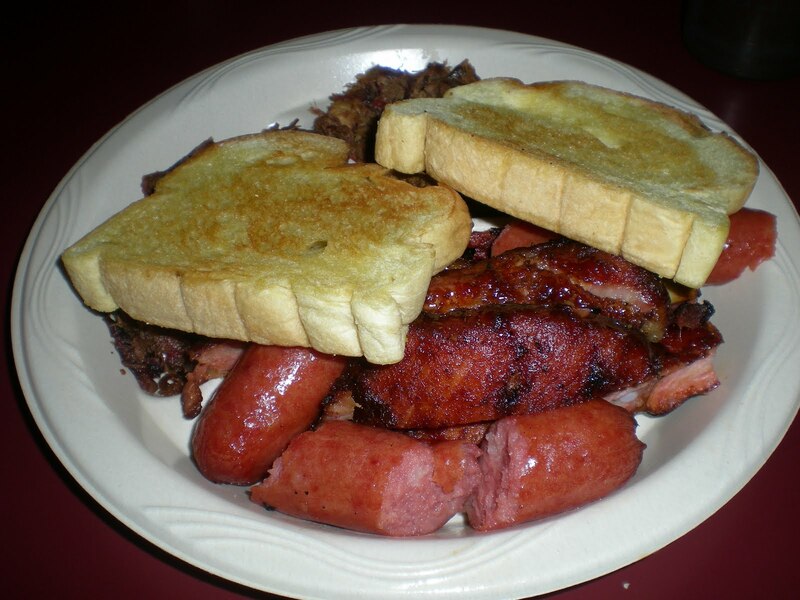 Ribs are the main attraction, but you can get a few other types of smoked meat served in sandwich form. As for sides, you can get a bag of chips, baked beans, potato salad, or cole slaw. Go ahead and get some spicy pickles too, just make sure your drink is handy! P.S. For those last minute folks, make sure to sign up for Kansas Pork’s grill giveaway today! The drawing will be tomorrow, July 15! It was time for another road trip a couple weeks ago, so I loaded up the family and headed toward Missouri. As we traveled, my wife and I found ourselves in Salina, around noon time. We decided to try the Hickory Hut for lunch. I had seen several favorable reviews on trip advisor and decided to try for myself. Can you smell it from here? The very first thing I noticed was that the smell of barbeque hit my nose as soon as we opened up the door. I always consider the smell factor to be an important part of the entire barbeque experience and this place did not disappoint. 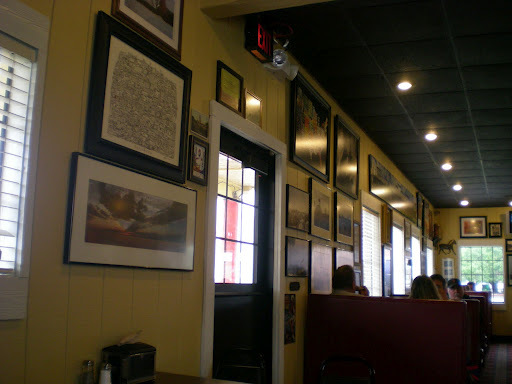 While I wouldn’t consider the Hickory Hut to be fancy, it is nicely decorated and I noticed that there was a constant line of customers from the cash register to the door. In the parking lot I found cars from all over Kansas and many from other states as well. This speaks volumes about the popularity of the place. While I was standing in the order line, I overheard one customer describe the place to an out of state friend as “good mild barbeque.” This is a pretty good description, as nothing was overwhelming or far out of the ordinary for what could be considered to be Kansas City style barbecue. 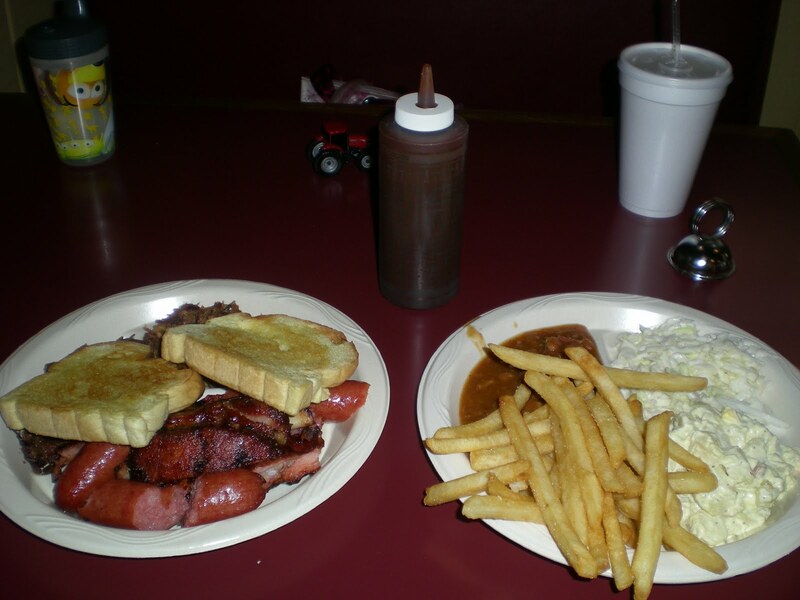 In fact, smoking with hickory wood is one of the definitive characteristics of Kansas City Style barbeque. My wife, son and I all shared the sampler platter which was plenty big enough for the three of us. I would certainly recommend the sausage and pulled pork. The beans, which contained ample amounts of meat, were above average as well. The French fries were good and the meal came with Texas toast instead of the cheap white bread many places serve. 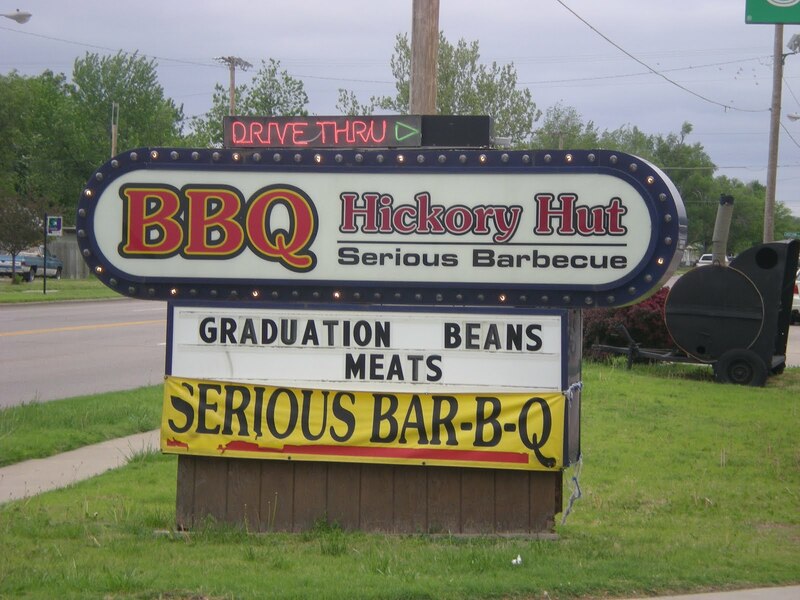 If your just passing through on Interstate 70 or if you live in central Kansas, you owe it to yourself to check out the Hickory Hut. As far as our giveaway, the Kansas Pork Association is still registering folks for the summer grill giveaway. If you’re looking to win a Genesis e-320 Gas Grill, head on over to KPA’s webpage and sign up to win.